Kean's side were relegated from the Premier League last night. 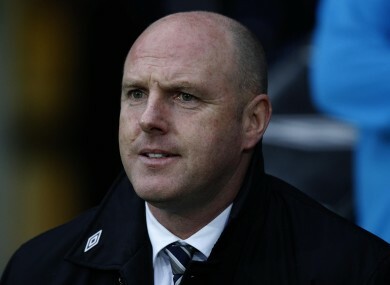 BLACKBURN MANAGER STEVE Kean remains defiant that he is the right man for the job after his side was relegated from the Premier League. Kean was given a hostile reception at Ewood Park on Monday after Blackburn’s 11-year reign in the top flight came to an end with a 1-0 loss to Wigan. But the beleaguered manager believes Blackburn can bounce back into the top flight at the first opportunity if he can keep the majority of his squad together. “I’ll sit down with the owners and discuss a plan on how to assemble a squad that can help us bounce back up straight away,” Kean said. “Certainly, we’ve lost a lot of confidence over the last six months in particular. Wigan secured their status in the Premier League for another term when Paraguayan defender Antolin Alcaraz headed in the only goal of the match three minutes from time. “It was going to be tough, but we felt as though we could have won,” Kean said. “The fact was that we had to win tonight. Then obviously we still had to go and beat Chelsea. “That was disappointing, the fact that we couldn’t take it to the last game because having to deal with three injuries on the night and reassembling the team, we’re still making a good go of it. A chicken dressed in Blackburn colours was thrown onto the pitch in the opening stages of the game while a supporter ran across the field in the second half and threw his season ticket in the air in protest. Kean, who replaced the sacked Sam Allardyce in December 2010, insisted Blackburn can recover from a Premier League campaign that has yielded just eight wins and 31 points from 37 matches. “I’m a big believer in my own ability and I’m a big believer in the guys I’ve got in the dressing room,” Kean said. “Each and every one of them I’ve spoken to, they are absolutely devastated. Blackburn travel to Chelsea for their final league match on Saturday. Email “'We must keep the squad together,' says Kean”. Feedback on “'We must keep the squad together,' says Kean”.